Wall console finished with polished stainless steel, a neutral and bright material that creates intriguing reflections of the objects and of the surrounding space. 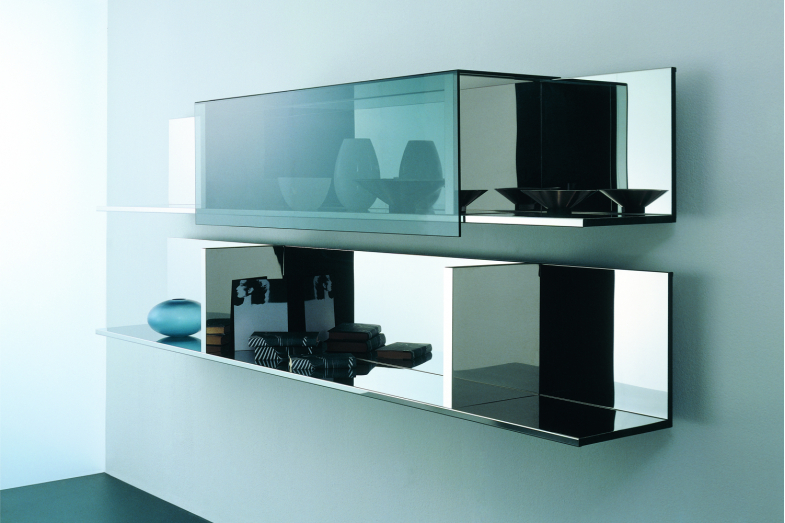 The shelf is divided in three asymmetric spaces. The central one can become a closed cabinet by means of a single ''L'' shaped door in tempered glass, with flap opening to the top controlled by air piston. STRUCTURE: Chipboard panels with matt synthetic finish. Inox steel sheet coating. DOOR: Glass door in float glass of 8 cm. thickness. HINGES: In brushes inox steel. SUPPORTS WALL: Clamps and fastening profiles in thick steel plate.